These days, Hermes is well known for their bags and scarves. In fact, they've been making watches since 1920s well before they started producing bags and scarves. 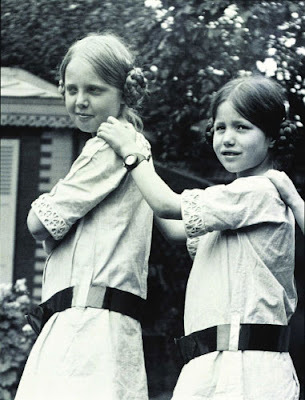 They started experimenting on wristwatches since the beginning of the 20th century. Jacqueline Hermes, daughter of Emile Hermes can be seen in the photo below wearing a pocket watch with a double strap in 1912. Henry d'Origny whose designs are sought after amongst Hermes scarves collectors created the Cape Cod watch based on links of the bracelet of chaine d'ancre (usual anchor). In 1998, then Art Director for Hermes RTW, Martin Margielacame up with the idea of double tour (strap). This has been on my wish list for quite sometime now. I'm not a watch gal. I tend to wear the same watch until it falls apart or no longer suits my lifestyle. Hubby, on the other hand, is a watch connoisseur. I've learned to nod my head and appear interested whilst going through the grocery list in my head whenever he breaks into a monologue detailing the engineering feat of automatic movement. My mother gave me my first proper watch, a Swatch that I've wanted for ages. I was devastated when our home was burglarized and my Swatch was one amongst the many things that were taken. Next, came a cheap Anne Klein watch which I believe was made in Thailand. A few years later, the glass dislodged and broke into a million pieces. Nine years ago, Hubby suggested I got myself a proper Swiss watch and promptly marched me to DFS (Duty Free Shop) in Hong Kong. I came out with a Tag Heuer and NZD $1000 poorer. 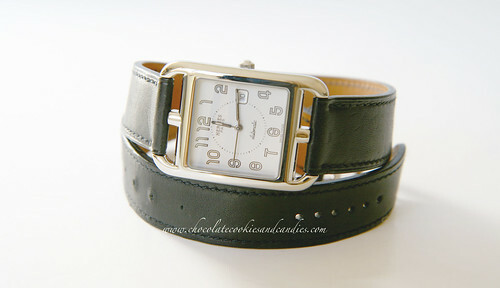 When hubby suggested a proper 10th year anniversary gift, I jumped at the chance to get a Hermes Cape Cod watch. I chose the GM Auto model (grande modele) because 1) hubby loves big watches and ONLY buys Automatic watches (what's wrong with Quartz???!) 2) I'm getting more and more long sighted so bigger is better in my case (!). Hi Linda! It's great to hear from you again. 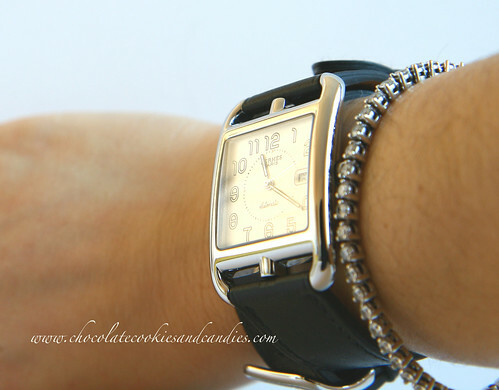 It's such a chic watch. I was tossing between the PM and the GM size. At least the black strap has a slimming effect and doesn't make it look like it's massive on my wrist. Hi Linda, this is the double tour version. I bet the pale pink alligator looks amazing and it stands out from a sea of the standard metal/black straps. Personally, I love that it wraps around my wrist twice because it looks like I'm wearing a bracelet AND a watch. I stuck to the black strap or else it'll look huge against my smaller than the average wrist. Congrats on both! The cape cod looks beautiful on you and thanks for the story behind. I have mine GM double tour over a year now (waves to the cape cod lovers above), wear it almost every day and still in love! Thanks, Rachel & q9y8, I'm really loving the double tour Cape Cod. I love the fact that it's bracelet AND a watch. Awesome watch. Quick question, is there a size difference on the double tour straps? Thank you, James. Yes there is. The double tour straps have two different lengths. Mine's the shorter version. It also comes in single straps and they both come in a variety of colors and skins. Hope this helps.